This year’s event will be aimed at raising awareness and funds for the British Transplant Games (BTG), with monies raised from the day going to support the BTG. Cumbernauld Gala Day will this year take place on Saturday 17th June at Cumbernauld New Town Hall, with a whole day’s schedule of acts, entertainment and festivities currently being finalised for what we hope will be the biggest Gala Day in Cumbernauld yet. To get booked up, simply download, print and fill out the form by clicking this lovely blue text: Cumbernauld Gala Day 2017 – Stall Booking Form. Once you have done that, please post your form to Cumbernauld Community Forum, c/o Link Community Centre, Bron Way, Cumbernauld, G67 1EW. Welcome to the Cumbernauld Community Forum website. If you’re new around these parts, you’re most welcome to have a look at our previous posts, and to learn more about what we at Cumbernauld Community Forum do. For those of you who are regular visitors to our website, you’ll notice some big chances to the design and layout. Yes, that’s right. 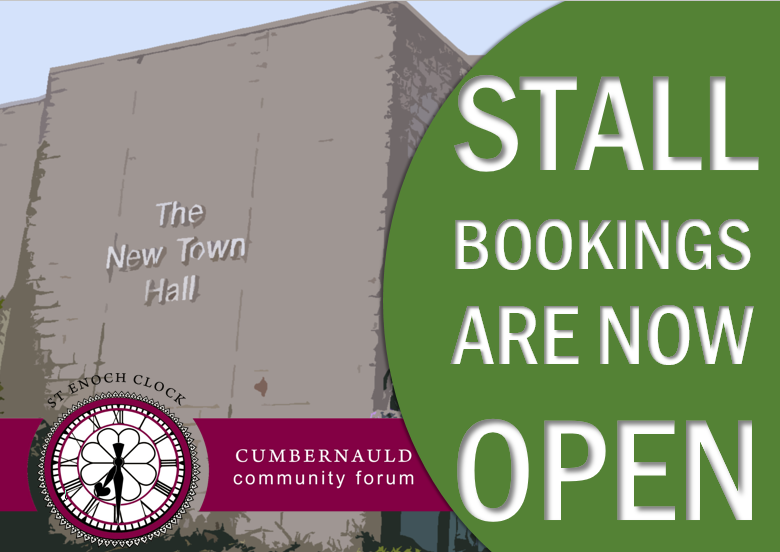 We’ve upped our game, and got ourselves a brand new, state-of-the-art looking website, one which matches our brand new leaflets, and aims to bring the Forum’s activities and campaigns closer to you – Cumbernauld’s residents – in an ever increasingly digitally-savvy world. The new design is responsive, meaning it adapts better to whichever device you use to access our services. This means that, in theory at least, our website will automatically change its front-of-house appearance, depending on whether you’re visiting us on a desktop PC, laptop, tablet or mobile phone. This new design will also run faster, and we hope, will help you find the content you want to reach, quicker. The plug-in for Facebook aims to promote our newly established page on the world’s largest social networking website – a page which, like our website, will be updated regularly with the latest campaigns, events, and news from around Cumbernauld. If you’ve not already, please ‘Like’ our Facebook page and ‘Subscribe’ to our website, using the buttons in the sidebar, and at the bottom of this page. In the meantime, it remains for us here at Cumbernauld Community Forum to wish you a belated Happy New Year, and to encourage you to get involved with your local Forum – our meetings all take place at 7pm, in New College Lanarkshire: Cumbernauld Campus, though the dates and locations are listed below anyway.